SANA/SUNTA 2019 Opening Day Event! The SANA/SUNTA Spring Conference is around the corner! 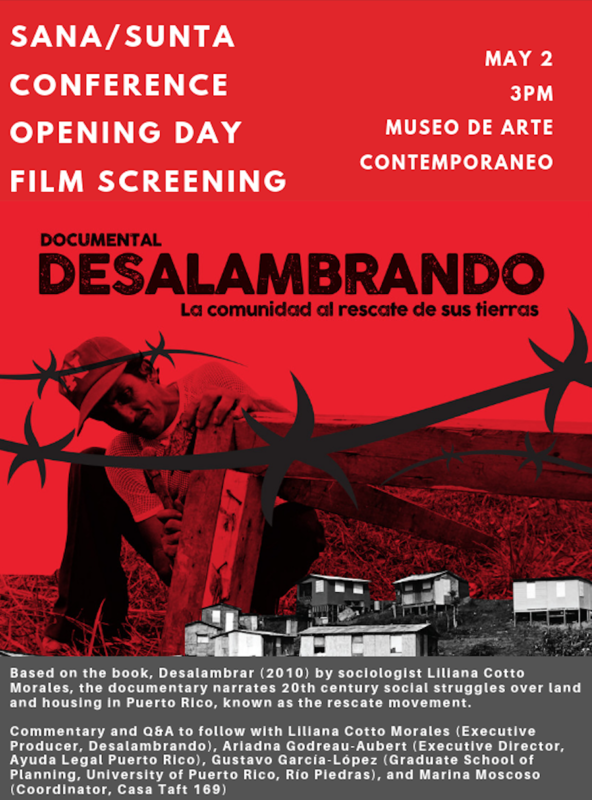 We will begin on Thursday, May 2 with a documentary screening of “Desalambrando” at 3:00 p.m. and the opening keynote by Yarimar Bonilla at 5:00 p.m. The conference will conclude on Saturday, May 4 by 8:00 p.m. Look for a complete schedule of events coming soon! The conference was originally located at the Hilton Hotel Caribe, but repairs to that hotel after Hurricane Maria are taking longer than expected. We are thus moving the room block to the nearby Condado Plaza and holding the conference at the beautiful University of Puerto Rico and Contemporary Art Museum. Regular transportation between the hotel and conference venues will be provided free of charge. If you have already reserved a room at the Hotel Caribe, it will be automatically transferred to the Hotel Condado Plaza. If you have not yet booked a room, we will be reaching out again soon with a direct booking link for you to secure your reservations in the new room block. Please keep your eye out for this email containing the booking link, as there is a major convention happening in San Juan at the same time as our conference and sleeping rooms in other hotels nearby are filing up quickly. If you have any questions, please contact us at positivefutures2019@gmail.com. Please be aware that the AAA will be phasing out the traditional list serves for each section next month (see announcement below). Beginning on March 1, 2019 the SUNTA list serve will no longer function and members will need to use the new AAA platform “Communities” to post announcements, inquiries, discussions, etc. relevant to our section members’ interests. To help bring our members closer together, next week we will launch Communities, a new communications platform that will replace the AAA-hosted email list service and offer significant enhancements to help you communicate, connect, and share with fellow anthropologists. In addition to a community where you will be able to connect with all fellow AAA members, each section, interest group, and committee will have their own community where they can interact in real time. Members will be able to post discussions directly through the platform, message each other individually, or reply to and start discussion threads via email. The platform also allows you to share files and offers improved search capabilities. SANA will continue to maintain its own listserv to communicate in addition to participating in Communities. Be a part of SANA’s leadership! 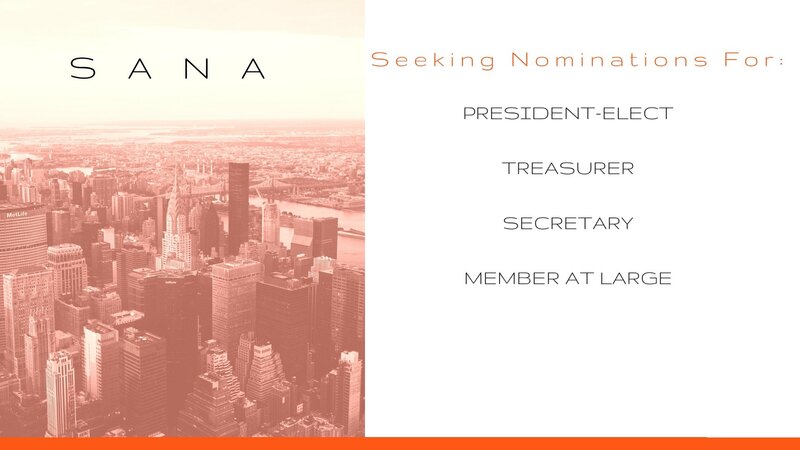 We are now accepting nominations for the following 2-year positions: President-Elect, Treasurer, Secretary, and Member-at-Large. Please send your nomination letter to Susan Falls at falls.susan@gmail.com by January 25th. Self-nominations welcome! 2018 SANA Book Prize EXTENDED! The SANA Book Prize Committee has decided to extend the submission deadline to August 30, 2019 in order to grow the pool of nominations. Eligible books must have been published in 2017 or 2018. The award will be conferred at the 2019 AAA meeting. Please navigate to the “Prizes” tab in the menu above or click here for further information regarding submission criteria and the selection process. The peer-reviewed Journal for the Anthropology of North America (JANA) has launched in the spring of 2018. The inaugural issue features research articles, a book review, and two new sections: Come to Terms and Snapshot. Read more about the Journal for Anthropology of North America by clicking on the tab at the left side of the website navigation menu. There were many excellent nominations for the 2017 for the SANA Book award. The committee decided to share the award this year between two awardees. Honorable mention goes to to Sarah Horton for They Leave their Kidneys in the Fields: Illness, Injury and Illegality among US Workers (UC Press). Materials for the SANA Section News in Anthropology News (AN) can be sent to David Flood (dnf6xb@virginia.edu) and/or Megan Raschig (msr2t@virginia.edu). Please join SANA through the American Anthropological Association Website here or by contacting AAA Membership Services. Copyright © 2019 Society for the Anthropology of North America. SANA is a section of the American Anthropological Association.